Comments: Deciduous broadleaf flowering plant from mountainous regions of western Asia and Europe. 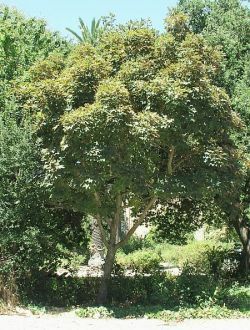 Dark green maple like leaves with 3 to 4 lobes and deep sinuses, edge serrated, underside of leaf is purple with short hairs, samara are large, pink, and form an angle of about 60 deg. Though this species can grow to 60' the specimen appears to be a much smaller variety. Spring color is salmon pink, but fall color is non-descript. This species was identified by Brian Benning.